Heidi: Have you worked with Kitchen Toke before? Frank: I was fortunate enough to work on the inaugural issue of Kitchen Toke. 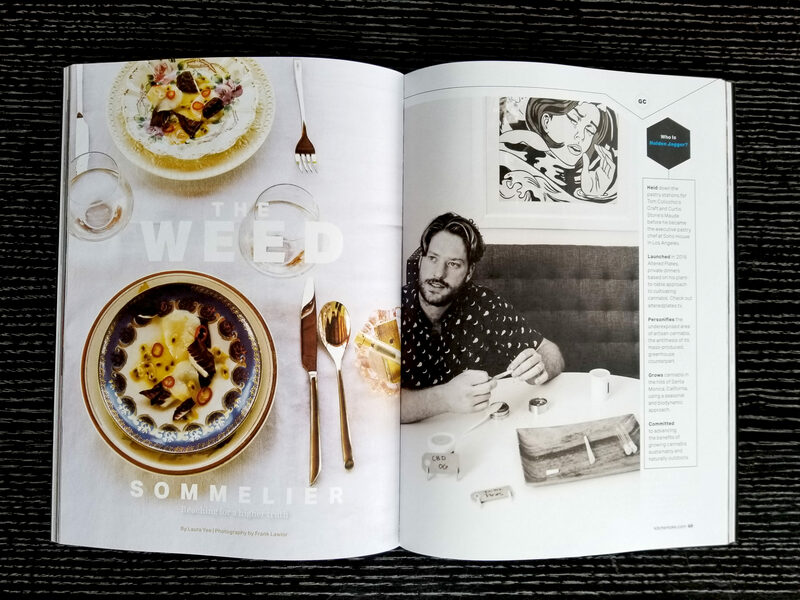 While we had all worked on food editorial projects before, this was the first magazine in the world dedicated to culinary cannabis. While similar in many ways to previous projects, Kitchen Toke presented creative, brand and legal considerations as the cannabis-friendly landscape is continually changing here in the US. How did they find you, or did you pitch this idea? I had worked with Joline Rivera, magazine creative director, on previous food projects for US Foods. She asked me if I wanted to help out with photography and video on their first story about Holden Jagger in LA. What was the biggest challenge for this shoot? I didn’t quite understand what it was all about at first – I thought he was going to cook with cannabis oils like the other chefs featured in the magazine. Holden is an experienced chef but he doesn’t cook with cannabis, he pairs cannabis strains to smoke along with a meal, much like a wine sommelier. This presented some challenges and opportunities, particularly in the way he prepped meals and rolled joints for guests. 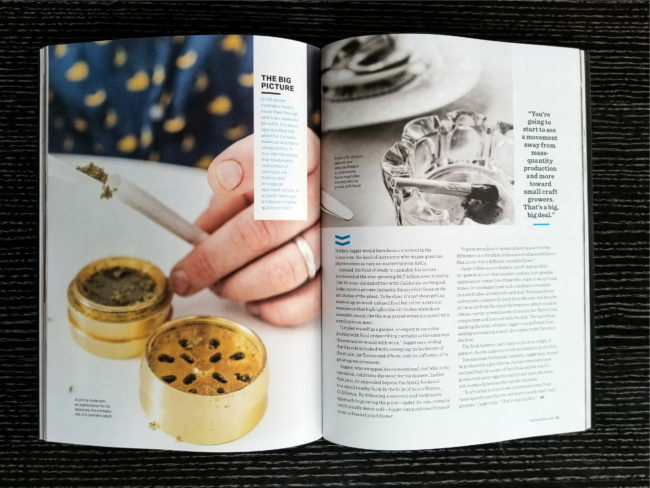 Kitchen Toke is a beautiful publication, by no means a typical stoner mag. The Kitchen Toke brand is carefully considered and tastefully executed. The challenge for the entire team was to capture Holden’s entire process while avoiding the urge to take the stereotypical “WHOA DUDE, LOOK AT THE SIZE OF THAT SPLIFF” shot. Joline’s vision and leadership was clear throughout the shoot, the goal was understood by the entire team: Keep it classy. Were you an art director first, and then became a photographer? My creative career is an ongoing disjointed mess of wonderful opportunities. I worked as an illustrator, designer, art director, creative director, photographer – not necessarily in that order. My client list includes large tech companies, small tech startups, fashion brands and charitable organizations. Whatever the client, the work is always better when I understand the story behind the image. I think getting to know the subject matter and the people behind the story is the most rewarding part of the job. Having a camera in your hand gives you an opportunity to learn about people’s motivation for starting a business, their passion for excellence, their fear of failure, everything that makes them interesting. Educated conversation makes the subject feel at ease and multiplies their expressions beyond the uncomfortable smile. We shot Holden as he shopped for ingredients at the Santa Monica farmers market, as he farmed his marijuana crops, and as he prepped meals in a kitchen. These three very different situations posed challenges, especially on his farm at noon in the southern California sun. I shot with different cameras (Sony A7RII, Canon 1Dx mkII), and used polarizers, scrims, and a variety of lenses. A simple macro lens is a photographers best friend when shooting food, but a fast 35mm adds to the story by showing the environment. While Holden was shopping, cooking or farming, I had to be ready to capture things as they happened. The optimal method is constantly changing, and you have to be prepared. Real life is what makes editorial projects so exciting – the story is most important.